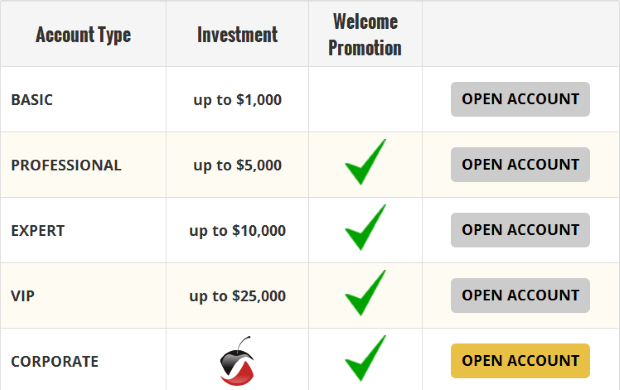 CherryTrade has been offering their binary options platform to traders since 2013. Since that time, they have become extremely popular among traders. The provided platform is the SpotOption 2.0, which is extremely user-friendly and loaded with investment possibilities. CT does not accept traders who reside in the United States. Offering above average return rates and many attractive extras, this is a brokerage worth taking a closer look at. The provided platform includes a massive number of potential trade configurations, yet is straightforward in its overall layout. Each provided asset class provides many different trade possibilities, with “hot” assets being pointed out. Among the useful elements of this platform is the provided live price chart, which delivers the potential to view previous price action for up to the past week. The platform can be viewed at any time on the broker homepage. The provided instruments include: Binary Options, One Touch, 60 Seconds, Long Term, Pairs, and Ladder. Also offered is a wide range of expiry times which range from a mere 30 seconds up to a full 24 hours. The highest possible payout rate on standard trades is 81%, with One Touch trades offering up to 180% or more. The 60 Seconds instrument requires only a $5 minimum investment, with standard options calling for a $25 per-trade minimum. Small refund percentages are offered on select losing trades. At last check, Cherry Trade was offering a total of 60 underlying assets. All assets are listed on the broker website, with each offering a description, along with the particular hours for trading the underlying asset. A comprehensive list of expiration rates is also offered. This list can help with strategies, comparing results for binary options signals, and more. Optional trade features such as Rollover and Double Up are provided and available with select standard trades. Several educational resources are offered, and these can be particularly beneficial to new traders. Video training courses help with education, and these do include advanced courses. An eBook and glossary provide the basics of binary options trading. Current financial reports and news are offered, but there are no advanced technical charts. Customer support is available 6-days each week (Saturday excluded) via live chat, telephone, and email. Financial extras such as bonuses and one-time credits are provided under certain circumstances. Unlike some brokers, CT offers these to not only new clients, but existing clients as well. All cash bonuses are linked to a 30x trade volume requirement which must be completed prior to withdrawal. Extra funds can also be awarded by referring friends and/or family members to the platform. When those people submit a deposit, the referring trader receives $50. There are a number of different account types offered, including Basic, Professional, Expert, VIP, and Corporate. Every account provides some perks, possible including individual training consultations, risk-free investments, trade insurance, trading signals, technical analysis training, and more. The Basic account can be opened with a deposit of either 200 Euro or 200 US dollars. The minimum withdrawal amount is set at 100 Euros or Dollar. Credit card distributions are free, but wire transfers cost $25 each wire. Payment processing time averages 3-10 days total. The primary concern that stands out with this broker is the lack of regulation. However, they are located in Gibraltar, a location which is yet to establish any regulatory authority. As far as reputation related to withdrawals goes, this broker is considered to be extremely reliable. For this reason, there seems to be little cause for any real concern on the part of traders. A lot of brokers offer some of the same things to their customers. If you have any questions, this will be like a FAQ section for this site. This Review is filled with answers, we just hope we covered everything you want to know. Currently they provide access to the platform through Android and iPhone. This makes it a lot easier to trade if you can’t be in front of the computer. We do recommend the fastest connection possible. A solid WIFI would be best. This will allow you to reach their servers at a faster rate. If you do run into latency, you may not want to use the App. This will be based on your experience. We’ve already mentioned some of the assets you can trade. Their fast data feed will allow you access to numerous stocks and plenty of Forex pairs. We’re not too sure how far you will dig into commodities, but if you want to trade gold, silver, platinum and others, you can do that too. You can click over to the main site too read more about these offerings. If you are new to trading, you need to understand that it is quite difficult to turn $200 into $1,000. Although the minimum deposit is $200, we still think you should make a much larger deposit. Over the long run of trading, you want to make sure you have plenty of money to use at first. We’ve talked about broker scams in the past and this is definitely a concern for many new people. The risk is not only with losing your money making bad trades, but you also have to worry about the broker just taking your money. Most sites these days are regulated, but for the ones that are not, we pick the sites we trust most. We feel that Cherry Trade is not a scam. You can deposit your money just like you would with 24option or any other big place. Can You Get a Deposit Bonus? Cherry offers multiple account levels. These are all based on your account size. The more you deposit the more you get in a bonus. Minimum deposits of say $200 will get a 25% bonus, while a Corporate trader will get up to a 100% bonus. Obviously the more money you put in the more extra you get to trade with. Although they have some of the best deposit bonuses, they don’t currently carry a no deposit bonus. However, if you contact them after creating a funded account, they may give you several risk free trades. This is like having a bonus. This will let you take trades without potentially losing any money. Like many brokers this will depend on your location and method of withdrawal. We’ve heard stories of hours too many days. Processing takes time, which is just part of this industry. Assuming you are patient this will not be a problem for you. The provided return rates, instruments, expiration times, and assets are excellent, while the deposit and withdrawal requirements are quite reasonable. Customer service is closed one day each week, but this is not a major drawback since most markets are closed on the weekend. CherryTrade is definitely one of the more attractive sites in business today for all traders.